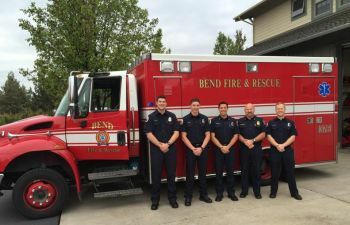 BEND, OR -- Bend voters could be asked in May to renew an operating levy for the fire department. Deputy Fire Chief Bill Boos told City Councilors this week a recent survey of 600 residents showed broad support for the department, "60% of those people said, ‘yes, we do excellent service;’ 21% just below excellent. The one piece I think we were kind of shocked about, only 1% said we did a poor job. If you think about government, we thought it was going to be higher than that." Voters approved a five-year levy in 2014, imposing a property tax of 20 cents per $1,000 of assessed value. City Manager Eric King says a approval of a new ballot measure would extend the levy another five years, "What’s being proposed is to keep that levy at the same rate it is currently. So, there’s not an increase in taxes or anything; it’s just to continue to maintain it." He believes there is community support throughout the fire district, "So, as part of that survey, we asked the very question that we would ask of voters, and the result was over 70% in the rural district and over 80% approval in the city." He tells KBND News, "Voters approved that levy to provide additional staffing and that additional staffing helped to improve response times and ultimately resulted in a major improvement in cardiac survivability. So, we went from 20% chance of surviving cardiac arrest, to 70% chance." King acknowledges the current levy doesn’t expire until 2019; but, he says it’s important an extension request be sent to voters a year early, "In case it doesn’t pass, we want to have a year to plan through that." He expects City Councilors will decide on a ballot resolution in mid-December. To listen to our full conversation with City Manager Eric King, click HERE or visit our Podcast Page.